Abdullah bin Saba' led the revolution against Uthmaan and the scholars mention that Naafi' bin Azraq (head of the extreme Kharijite sect, the Azaariqah) also participated in this revolution. Between them, the Raafidah and the Khaarijites led the revolt against the ruling authorities and their legacy has never ceased to continue to this day of ours. This indicates a continuing interplay between Rafd and Khaarijiyyah and in the 20th century this manifested clearly through the organization of al-Ikhwan al-Muslimun and some of its leading figureheads such as Hasan al-Banna and Sayyid Qutb. These individuals came out with the slogans which are familiar, "social justice", "jaahiliyyah", "haakimiyyah." The Gulf countries which are largely and broadly upon Tawhid and Sunnah, more so than all other Islamic nations, are being plotted against by the Shi'ite proxies in their lands (supported by Iran) and the takfiri Kharijites. Both of these movements were inspired by the writings of Sayyid Qutb, a Freemason, whose Marxist poison was preceded by that of Jamal al-Din al-Afghani, a Baatinee, Raafidee Freemason. 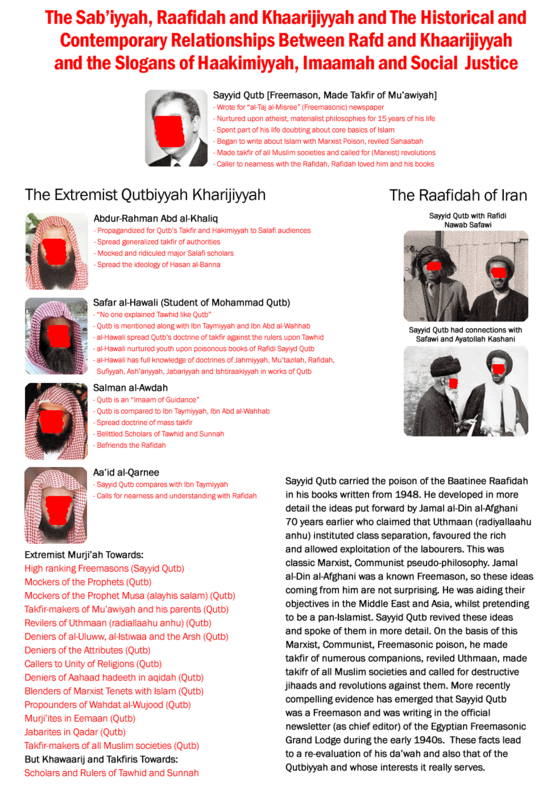 Learn more in the series on "The Baatinee Movements, Secret Organizations, Freemasonry, Al-Ikhwaan, al-Qaidah and ISIS" (see here).